Betsy Thorpe studied folklore and ethnic anthropology at the University of Oregon and is a scholar of early twentieth-century Southern culture and history. A freelance writer, Betsy specializes in reflections on historic and current events. She lives with her daughter and three granddaughters in Nashville, Tennessee. Thorpe is an honorary member of the Bellevue Harpeth Historical Association, the Nashville, Chattanooga & St Louis Railway Preservation Society, and Nashville Historic, Inc. The author is most proud of her awards in 2011 and 2012 of a private, individual Writer's Room at the Nashville Public Library, an honor bestowed by its Board upon a select number of authors. When Betsy is not writing or day dreaming about the past, she and her three granddaughters enjoy watching primetime soaps and crime shows on TV, bicycle riding, cooking Rachael Ray 30 Minute Meals and taking Greyhound Bus and Amtrak Train adventures together. 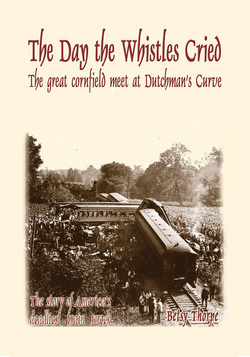 The Day The Whistles Cried: The Great Cornfield Meet at Dutchman's Curve is her first book. Two steam locomotives collide head-on in a cornfield at the edge of Nashville on July 9, 1918, taking the lives of more than a hundred people and injuring at least 300 others. This tragic tale, set against a backdrop of wartime urgency and human error, unfolds in the midst of the racial and societal divisions of the early twentieth century. Segregation and cultural mores helped decide who would perish and who would survive this cataclysmic event, resulting in a book that is more than fact: a riveting story of decided historical impact.